In a world of claims to fame, there are frequently debates over discovery and credit taken: Amerigo Vespucci vs Christopher Columbus on the new world, Leonardo Da Vinci vs Karl Benz on the automobile, and apparently Fernand LeChance vs Jean Paul Roy when it comes to poutine. Poutine, natively from the Canadian province of Quebec, is a popular side dish, made with french fries, cheese curds, and topped with a light brown gravy. LeChance contends that his invention comes from a late night customer in late 1950s who demanded fries and cheese be thrown in a bag together to meld. In his 2005 obituary, the alleged customer, Eddy Lanaisse, came forward as that once-demanding customer. But Roy is noted for the creation of the famous sauce (gravy, for argument’s sake) and poutine has stuck with this signature topping from the 1960s onward. So why the history? Because through the 1970s and beyond, this storied side dish made the short drive across the border, gained fame and notoriety, and landed firmly in the Rochester dining scene. Once considered an “embarrassment” due to Montréal’s notability for fine dining and French cuisine, poutine strikes the perfect balance between high brow and low brow, while also entrenching itself as seasonally appropriate whether you’re taking in the sun, Lake Ontario, or a festival in the warm months, or looking to heat up in the cold months, as the snow coats our trees. Le Petite Poutine is the pièce de résistance when it comes to poutine. It makes its way around the area’s most popular locations and events. It’s not uncommon to see a line of folks wrapped around a park or parking lot as they queue up for this fan favorite. 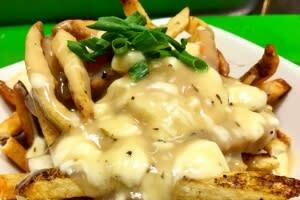 Of note is the breakfast poutine, which can be enjoyed all day. It features french fries, beef gravy, fresh thyme, bacon, and an over easy egg, wrapped for your convenience in Le Poutine’s signature take-out carton. If you find yourself downtown on business and short on time, Legends Sports Bar & Grille at the Radisson Hotel Rochester Riverside, located adjacent to the Joseph A. Floreano Convention Center, can provide a poutine fix. While the venue sports an impressive bar ideal for post-meeting gatherings, an abundant menu of American favorites, and plenty of seating, I suggest that the poutine here is worth the visit alone. Made with light brown gravy, fries, and cheddar cheese curds, it’s a huge helping for only $9, so if you can’t handle the large helping yourself, split it with a friend or colleague. I also dig their other selections, such as the weekly burger challenge, which boasts a dueling duo of sliders. 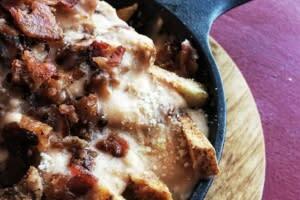 While Orbs is known for its signature meatballs, their gourmet poutine shouldn&apos;t be overlooked. I’d recommend pairing it with a selection from the extensive craft cocktail menu, where big-city drinks are available at a reasonable price. The poutine comes doused in beer cheddar, duck fat gravy, queso fresco, an egg, and smoked paprika, which seems to be the real clincher. For those seeking a real meal, you add your favorite proteins for an extra $3. The Old Toad stands tall as a truly authentic British Pub, offering a hearty selection of libations from local purveyors, as well as those from across the pond. While poutine is frequently featured as a special, it’s not standard to the menu. 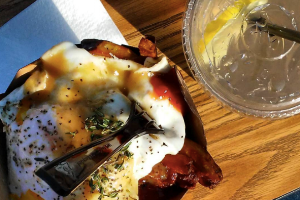 But it appears on this poutine-focused list because both beef and vegetarian are gravies always available as a side to their British-style chips, so with a kind word, a polite guest can almost always get the fine OT staff to craft a custom poutine. As your pint is being is being poured, your toughest decision will be whether it should come smothered in cheddar jack or bacon. Founded in Syracuse, but never overlooked in Rochester, this once-mobile “BBQ out of an oil drum” operation has turned into a regional gem. As its name implies, there menu sports an abundance of southern-smoked favorites, but even the ‘Dino’ couldn’t escape the influence of Montreal, offering poutine consisting of hand-cut fries topped with a beef gravy, housemade pimento cheese, and pulled pork. 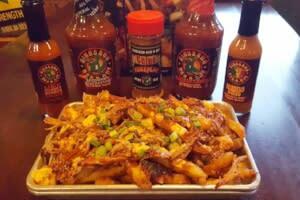 It’s a great way to sample the area’s poutine craze as well as Dino’s excellent pork. Commonly thought of as a library of cocktails, Nox in the Village Gate is a secret hideaway for comfort food. “It’s a Trap!” is the name given to their take on poutine, which is made of hand cut fries, a smoked gouda cream sauce (which plays the part of both curds and gravy), and a sprinkling of gluttony. Worth noting are their unbelievably comfortable barstools, highly knowledgeable staff, and the book your check will arrive in. Continuing the tour of duty, just outside the core of the city you’ll find Spanish Poutine inside the friendly confines of the warm and inviting Ox and Stone . 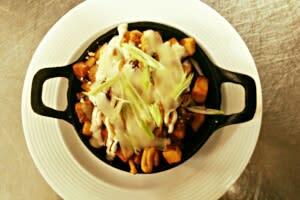 Here poutine looks like roasted potatoes covered in gravy, romesco, queso fresco, manchego, and crema. Order it “plain”, as described, or as I would recommend, with a smattering of chorizo for just $2 extra. The Ox has tremendous cocktail knowledge and is adjacent to a number of nightlife destinations near Alexander St and East Avenue. 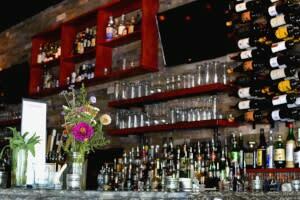 Victoire, a Belgian Beer Bar is accessible on foot from most of the downtown locations you’ll find yourself. Besides their significant menu of gourmet mussel dishes, Victoire knows its way around the kitchen with duck as well. This is shown off no better than with duck poutine, made of hand cut fries, duck gravy, local cheese curds, and duck confit. The venue boasts a world class beer selection, but cocktail and wine lovers will be happy to learn that a selection of both are available as well. I’d suggest an easy seat at the bar for a solo lunch, or working your way towards a patio or fireplace, depending on the season. Anchoring the foot of the Hilton Garden Inn Rochester Downtown is Drifters. 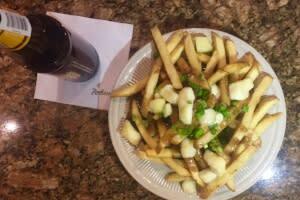 The venue offers the standard configuration of fries, gravy, and cheese, topped with freshly cut scallions. The bonus here, though I’ve never had occasion to stay in the hotel personally, is that most of the standard menu, including this shareable option, are available on the room service menu. Poutine in bed! Still not enough poutine? Then be sure to try these Rochester and Finger Lakes spots for more cheesy curd goodness. Jeremiah&apos;s Tavern: Available at all three locations throughout the Rochester region. B-Side: Find this location is the charming village of Fairport, NY. Upstairs Bistro at the New York Wine & Culinary Center: Featured item for Saturday and Sunday brunch. Harts Local Grocers: The cafe offers a delicious poutine of root veggie fries topped with shredded turkey, cheese curds, gravy and a fried egg. 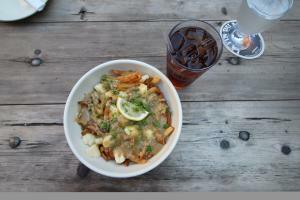 The Exchange at Corn Hill: Get your classic poutine and then enjoy a stroll along the Genesee River. 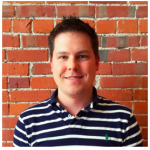 Mark&apos;s Pizzaria: Not a fan of poutine? Then try the American style cheesy fries at any Mark&apos;s location.